Next performances: Tomorrow at 8 p.m. Sunday at 2:00 p.m. I apologize for the length of this review, but I want to begin by telling you a story. Wagner’s Ring cycle — Der Ring des Nibelungen — first came into my life in the early 1970s when I was living in Montreal. Time-Life Records reissued the famous London Decca recording of the Ring from the late 1950s and early 1960s and delivered it one opera at a time to my mailbox on LP records in beautifully bound cases. This recording was ground breaking in many ways. It was the first studio-recorded Ring to be released commercially. It featured a then relatively unknown (in the U.S. at any rate) Georg Solti conducting the Vienna Philharmonic. The singers included such legendary names as Birgit Nilsson and Kirsten Flagstad. Under the technical leadership of John Culshaw this was also the first recording to show people how the new long-play recording technology could perform. Among other things, there were magnificent sound effects. This became a landmark, not only in recording in general but also in the history of recorded Rings. The first opera, Das Rheingold, was delivered in a box that included the libretto in English and German and three hard-back books — Richard Wagner: the Man, His Mind and His Music by Robert W. Gutman, George Bernard Shaw’s The Perfect Wagnerite, and, most importantly, Ring Resounding, Culshaw’s recount of how the original recordings came to be made. That first shipment also included An Introduction to “Der Ring des Nieblungen” by British musicologist Deryck Cooke, which proved to be a superb way to learn the entire cycle — it’s still available in CD and via download — I highly recommend it! After that first shipment I was hooked! I called Time-Life to see if I could just buy the other three immediately instead of having to wait each month to receive the next installment. No such luck. The calendar turned slowly. One thing these recordings did was to make me appreciate my sense of imagination. All I had to do was listen and dream of how these opera would be staged. I never imagined that I would ever actually see a Ring in person (my wallet laughed uproariously at the idea that I would travel to New York City for a week to hear a cycle at the Metropolitan Opera, let alone Bayreuth). The concepts of VHS, laser disc, DVD and Blu-Ray were so far off that only a few visionaries could see them. So it was just me, the music, and my mind. As it turns out, having now seen three complete Ring cycles plus parts of two other cycles in person, part of the latest Met cycle in a movie theatre, owning the James Levine-conducted Ring at the Met on laser discs, and having viewed two other versions on DVD, I remained convinced that what I first envisioned when I was listening to those Time-Life records remains the best staging ever. This is a very long-winded preview to this morning’s performance by the Los Angeles Philharmonic entitled “The Best of Wagner’s Ring”. In some respects, like many such marketing titles, it’s overblown — how can it be the “best” when it doesn’t have the entire “Wotan’s Farewell” or anything from Siegfried except “Forest Murmurs” or (insert your favorite section)? However, if you consider the “best” in the context of today’s performance, it comes very close to the mark. This afternoon’s performance was 85 magnificent minutes of music (out of the 18 or so hours an entire production would take). There was no staging and only one singer (but what a singer!). On the other hand, this performance had an oversized L.A. Phil onstage at Walt Disney Hall to perform the music. There were musicians everywhere on stage, including 16 winds, eight horns (four more than normal), five trombones (two extra), two timpani players, as opposed to one, seven percussionists (two extra) — several of whom hammered actual anvils — and six harps. The brass section, in the middle and back of the orchestra, stretched almost from one side of the stage to the other. 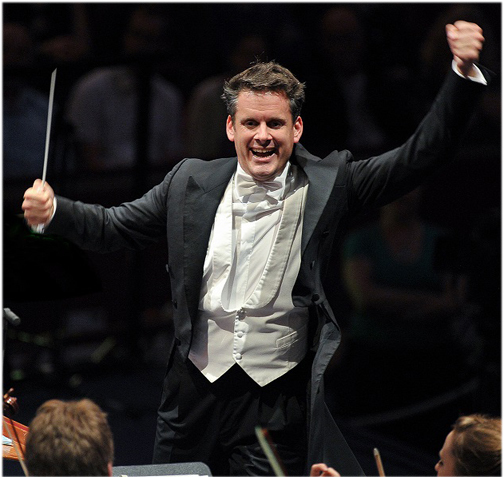 Swiss conductor Phillipe Jordan, music director of the Opéra National de Paris and chief conductor of the Vienna Symphoniker, was making his Disney Hall and L.A. Phil in the program, one that he has recorded previously with his Paris Opera forces. Swedish soprano Iréne Theorin was on hand to sing the “Brunnhilde’s Immolation Scene,” the climax of the opera Götterdämerung and, indeed, of the entire cycle. The 42-year-old Jordan cuts a dashing, athletic pose on the podium, crouching almost to the floor to get the soft dynamics that help make Disney Hall a wonder. He also crafted an expansive collage of portions of the Ring, far beyond what we usually get in concerts, and conducted it from memory. Where most conductors would be content to open with the “Entrance of the Gods into Valhalla” from Das Rheingold, Jordan began with the Prelude, with that low E-flat that sets the entire work into motion and then morphs into the river Rhine motif. He continued with the orchestral interlude between scenes 2 and 3 (Rheingold plays as one continuous act with the four scenes separated by these interludes, which are the bane of stagehands because of their brevity). Only then did Jordan transition to the “Entrance of the Gods” but he preceded it with the music that sets up “Rainbow Bridge” theme and the concluding, majestic measures. After the obligatory “Ride of the Valkyries” Jordan turned to the “Magic Fire Music” that concludes “Die Walkure,” but again he preceded those concluding measures with enough of “Wotan’s Farewell” to give those who know the opera the sense of why the “Magic Fire Music” is so important. I wish that the LAPO had hired somewhat like Eric Owens to sing the entire lament, but maybe next time. Jordan concluded the program’s first half with “Forest Murmurs” from Siegfried. As was the entire performance, there were amazing moments from the orchestra — in fact, hearing this music with the orchestra onstage and nothing from a stagecraft point of view to distract caused me to marvel again of how Wagner could write so brilliantly for the orchestra. After intermission, Jordan elided all three sections he chose from Götterdämerung, the last of the four operas. He began with “Dawn” and “Siegfried’s Rhine Journey,” continued with “Siegfried’s Funeral March” and concluded with “Brünnhilde’s Immolation” that concludes the opera and the cycle. The orchestra was magnificent — there is simply no other word for it. Every section and every soloist played beautifully, with special kudos to Burt Hara, clarinet, David Howard, bass clarinet, Nathan Cole, concertmaster, Andrew Bain, horn, and Marion Kuszyk, oboe. Whenever Jordan gets to conduct a Ring cycle in the opera house, it’s highly unlikely that he will be able to reproduce the sound he got from the Phil today. As the final notes of “Siegfried’s Funeral March” were fading away, Theorin (pictured right, although she wore black instead of red today) walked slowly on stage. The Swedish soprano has sung the role of Brünnhilde in major opera houses around the world and it was easy to see and hear why. She poured out all of the pathos, bitterness and, finally, redemption in that final scene with a powerful sound was never strident but cut through the orchestra sound fabric like a hot knife on butter. Jordan did an excellent job of balancing the orchestra with Theorin and the results left me in tears, as the scene played out in my imagination. If you can get a ticket for one of the remaining performances, do so! 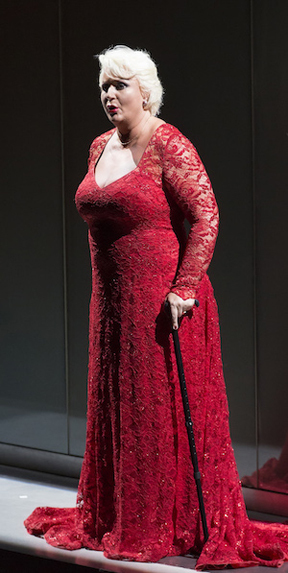 And if LA Opera ever gets around to re-mounting its Ring production, Iréne Theorin is its Brünnhilde.